I know it seems as if I’ve fallen off the face of the earth, but I really haven’t!!! I’m still here! Things have been busy lately and updating my blog just kept getting pushed further and further down the list. I’m going to post 5 entries today, the other 4 will be ahead of this one, but if you are subscribed to my blog you will get them in the right order. If you haven’t subscribed, there is a box on the left hand side for you to do that…you don’t have to check here for updates…they will get e-mailed directly to you! 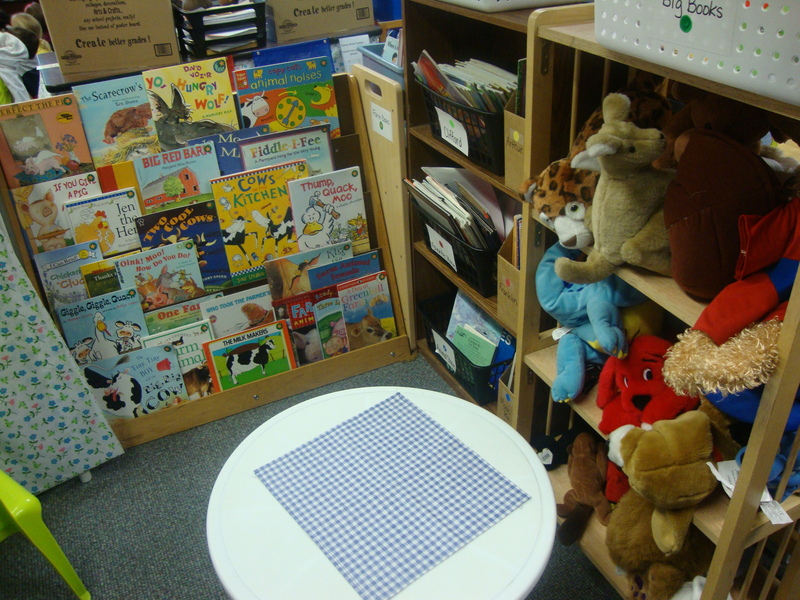 Here are some pictures from our Library Work Station. It is a constantly evolving area. Each time we learn about a new topic, I put books pertaining to that topic into the large front facing bookcase. 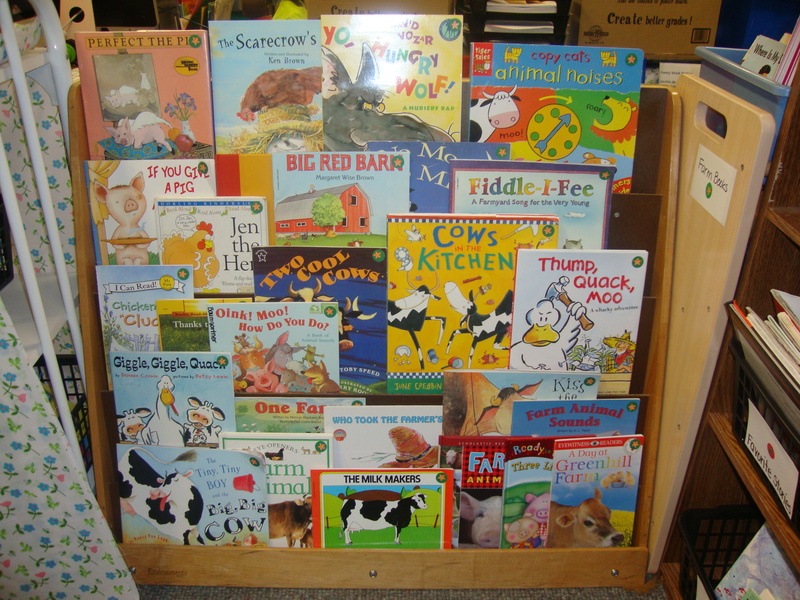 You can see our farm books in the front facing shelf in the pictures. The baskets on the tall brown book shelf stay the same and the old books from the front facing bookcase get moved to the top of another bookcase. 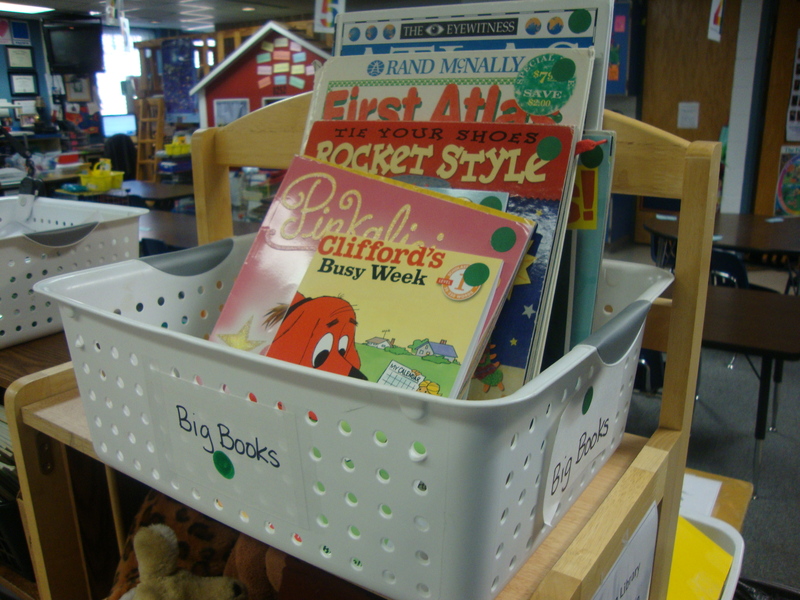 We’ve also just added a basket for Class Books. These are the books made by the children for the children. So far, we have three books in it, “Where we live”, “Homes”, and “Mrs. Wishy-Washy”. I just keep the labels the same on the books that are in the front facing bookcase. They all have green dot stickers on them to help them get returned to their homes. This system is working great!! I find that very few books make it back to their correct baskets. Those of you who know me well shouldn’t be surprised by that statement at all!! I’m constantly changing the way I do things to keep my self up to date and to keep up with the kids interests. Anyway, my plan is to talk a bit about a specific animal each day (10 of them) and create anchor charts for each one, and then tie in a Nursery Rhyme when possible. It think I was able to find three rhymes about sheep, so we will know plenty about them!! Nursery Rhymes are so critical to learn in Kindergarten! If you haven’t used them in your classroom before, I would suggest you try and fit them in. I’ll be tying others in later when we do our Gingerbread Man unit in December. We’ll be using more Fairy Tales then. Let me know of any farm ideas you have…I’d love to hear suggestions! !